Have finally been able to order Infinity2, so only another month to wait for the hoped super speeds. I assume all I will need to do is plug in the BT hub and it will do the rest. If any member has experience of doing an installation I would be happy to hear the pros and cons so that I can be ready. Yeah plug in hub and off you go, for best speeds ideally modem connected to the master socket via a VDSL faceplate. So question is how is the existing modem plugged in? My BT Smart Hub is connected via a filter to the Master Socket (which is the one with a line down the middle and 2 screws to take out to get to the test socket). BT engineer installed this master socket recently. Well, there is an extension that was put in by an ex BT engineer who fitted it when he came to install Sky TV. Do not have Sky any longer and my telephone is plugged into it. The wires from this extension go into the back of the Master socket. If all is going to the back of the master socket, do you have all 3 of these connected up, shown in the image below? Image of NTE5A Master socket + xDSL Filter Faceplate + Phone Faceplate. If you have all 3 and its all done right then you should be fine. 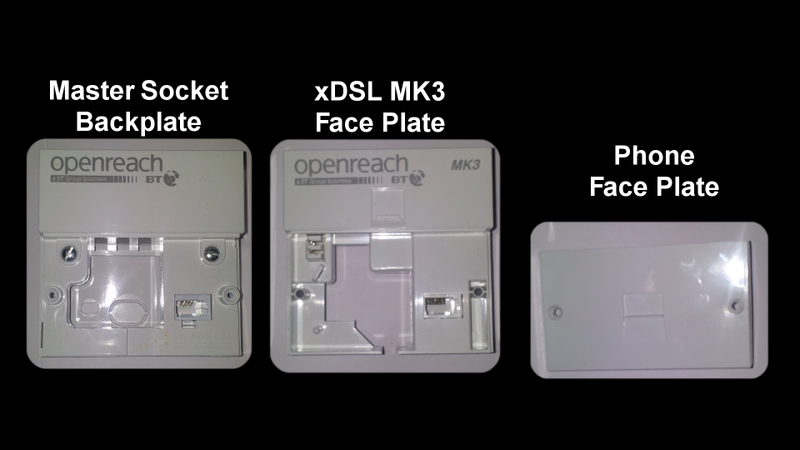 The middle image of the xDSL Filter Faceplate will have a data connector (i.e. RJ45 Socket) on it where you can connect your Smart Hub into using the supplied cable RJ11 flat cable which will also fit into the RJ45 socket. The wires from this extension go into the back of the Master socket. If you remove the front faceplate to access the test socket, the phone should stop working. If the phone still works then the extension is wired incorrectly. Removing of course needs to be done gently because of the connected wires. That's if it is an NTE5A, not a new NTE5C. Then there is the question of the ring wire. Almost certain to be present. The OP says the current modem/router is connected through a filter to the master socket. So they don't have an interstitial filter plate.